The circle has been known since before recorded history. Over time, circles have often represented associations such as a circle of friends or from the infamous “Meet the Parents” movie, the circle of trust. A.H. Munsell was not the first to apply Euclid’s element to color. As early as 1706, Sir Isaac Newton is thought to have developed the first hue circle in which he varied the size of each segment based on a calculation of wavelength. Newton’s hue circle demonstrated additive mixing properties and the relationship between primary hues and their complementary color counterparts. The circle appeared to be more conducive to illustrating the relationship between colors and is still used in the modern day color wheel, which designers use to help choose a color scheme. Munsell took the hue circle a step further. As Munsell’s research evolved, a two-dimensional hue circle was only adequate to describe a single dimension of color, namely hue. Munsell turned to Euclidian geometry and architecture to more adequately describe the three-dimensional relationship between his three attributes of color—hue, color value and chroma. Munsell was the first to represent color in perceptually uniform dimensions by representing his three attributes of color—hue, value and chroma—in a three-dimensional color space. His later work, measuring human subjects’ response to color, continued to support his use of a three-dimensional color solid; however, the shape was less uniform since it was based on human visual perception. So although the hue circle or color wheel is still an effective way to represent color relationships, when it comes to visual perception and three-dimensional color space, the circle is somewhat distorted. Munsell books of color reflect the visual perception of color, making them and effective tool for color communications. Learn more about the Munsell hue circle and how the hue circle can help you effectively communicate color. A. H. Munsell Color Diary, 1908-1918, Volume A Part 8. Courtesy of Rochester Institute of Technology, Munsell Color Science Laboratory. Can you purchase a copy of the Munsell hue circle? I am a k-12 art educator in a public school in New York. 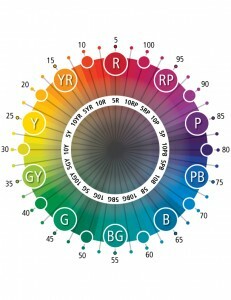 I’d like to purchase a color wheel for my classroom, and perhaps some other products. Do you have educator prices? Thank you for a prompt response. I wish I could afford many of the charts and models too, but I just really need a well made ten step color wheel. Customer support will be emailing you directly to help you with your questions. Thank you for helping to education the future generation about our color system!